AUTHENTIC Australian Labradoodle puppies, born and raised, in our home (& our daughters and son's homes). These are multi-generational, non-infused and therefore are ALWAYS: non-shedding, hypo-allergenic, intelligent, intuitive and loving temperament. Our breeding pair parents are tested and professionally certified free from inheritable diseases such as PRA, hip dysplasia, EIC and more. Our mission is to continually improve the breed while providing loving companions and/or assist dogs to loving-kind and responsible forever families. Our puppies are spayed or neutered before they move to their forever home, micro-chipped, health guaranteed for 2 years and crate trained when delivered. We are a small, family run breeder specializing in curly coated, non shedding multi-gen Labradoodles. We are located at almost 8000 feet in Northern New Mexico but have happy customers all over the US. We are re-locating to Florida and looking for select guardian homes for our breeding dogs. Please visit our web site at .floridacoastlabradoodles for more information. At rainpuddles we take great pride in our beloved bundles of joy!! Our primary goal is for all our precious puppies to have the best possible forever homes with families that are prepared for the commitment and can love and care for them. We breed miniature and medium multi generation Australian Labradoodles. All breeding stock are genetically tested for diseases inherent to the breed. We raise our puppies in our home with Early Neurological Stimulation and Puppy Culture practices. Located in Utah. Downeast Doodles is a responsible breeder of CKC Australian Labradoodles, Goldendoodles and Doubledoodles based in Comer, Ga. Established in 2010, we produce quality, healthy, family friendly, with a focus on temperament, and structural soundness. We are happy to answer any questions you may have about our doodles. Thanks for visiting! 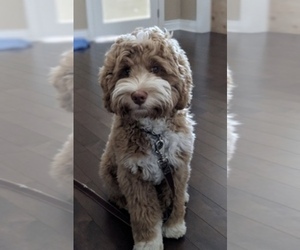 Looking for a reputable Australian Labradoodle breeder in your area? Simply browse through our nationwide directory of 1000s reputable Australian Labradoodle breeders - complete with website addresses, dog breed profiles, and current puppies for sale.